Gates’s words give us an immediate clue that he is engaging in his own brand of magical thinking—which social scientists define as “illogical causal reasoning.” How else to explain his simplistic endorsement of vaccines as a miraculous intervention with unmitigated benefits and no down side? The Gates Foundation’s global spreadsheet appears to have no room to tally the massive flood of vaccine injuries afflicting children worldwide, despite abundant evidence that this damage is standing the vaccine risk-benefit calculus on its head and turning childhood into an extended round of Russian roulette. 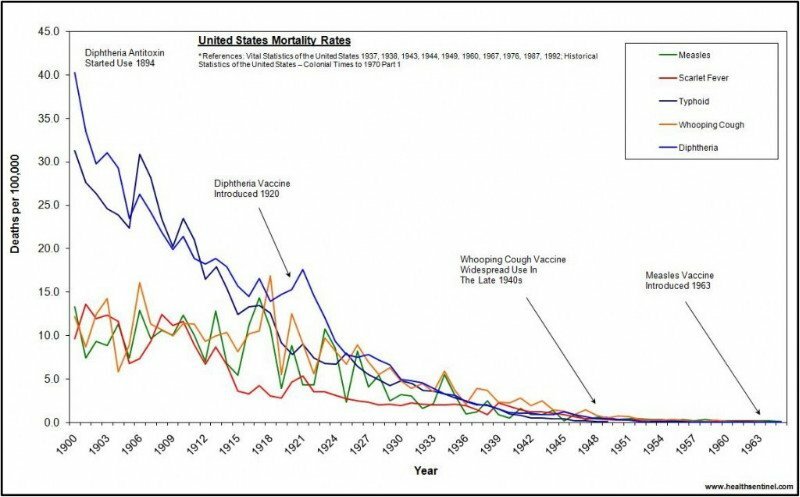 In a widely cited 2014 blog post on the “miracle of vaccines,” Gates expressed enthusiasm about the “inspiring” data on vaccines and the “fantastic” and “phenomenal” progress being made to expand vaccine coverage. There is one major problem with Gates’ professed reliance on “data,” which is that the philanthropist ignores fundamental historical facts governing infectious disease and vaccine timelines. There is one major problem with Gates’ professed reliance on “data,” which is that the philanthropist ignores fundamental historical facts governing infectious disease and vaccine timelines. The same researchers, in another article, chastised the medical establishment for its misplaced confidence in “magic bullets” (there is that word “magic” again!). Instead, if the decline in infectious disease incidence and mortality in the last century represented any kind of “miracle,” the phenomenon was, by all honest accounts, attributable to classic and long-term public health measures such as better sanitation and, especially, improved nutrition. A study of 20th-century mortality trends in Italy found a significant association between increased caloric intake and declining mortality, reflecting “progress in average nutritional status, lifestyle quality, socioeconomic level and hygienic conditions.” Moreover, mortality dropped most sharply in Italy’s youngest age groups—who were “probably the most sensible to the changes in nutrition and wellness.” Even early 20th-century epidemiologists who were inclined to give some credit to vaccines recognized that other factors were at play, including changes in “human resistance and bacterial quality” as well as factors yet to be determined. Oh Miracle, Where Art Thou? Even if one leaves 20th-century vital statistics behind, there is a glaring piece of evidence that gives the lie to Bill Gates’ disingenuous assertions about vaccine miracles: vaccines are not actually making or keeping children healthy. Instead, in the U.S. (where children are the most highly vaccinated in the world), over half of all young people have a chronic illness—a trend that coincides with the expansion of the nation’s vaccine schedule. Similar patterns of chronic illness are emerging worldwide, including for potentially life-threatening conditions such as food allergies and asthma. …there is a glaring piece of evidence that gives the lie to Bill Gates’ disingenuous assertions about vaccine miracles: vaccines are not actually making or keeping children healthy. Thirteen percent of U.S. children are in special education. One in six American children has a developmental disorder such as autism spectrum disorder (ASD). Attention-deficit/hyperactivity disorder (ADHD) affects nearly 11% of American children. One in 20 children under the age of five has epilepsy. Peanut allergies are the most common cause of food-related death. Women who receive flu and Tdap vaccines during pregnancy are at greater risk of miscarriages and other problems. Pediatric autoimmune neuropsychiatric disorders associated with streptococcal or other infections (PANDAS or PANS) may affect as many as 1 in 200 children in the U.S., including up to 25% of children diagnosed with obsessive-compulsive disorder (OCD) and tic disorders. Sensory processing disorder (SPD) often co-occurs with ADHD and ASD. In the U.S., the infant mortality rate, including from sudden infant death syndrome(SIDS), is double the rate in many other high-income countries. In Africa, a comparative study in Guinea-Bissau found that infant mortality was at least twice as high (10%-11%) in children who received the diphtheria-tetanus-pertussis (DTP) and polio vaccines as in children who did not receive the vaccines (4%-5%). A recent German report on global philanthropy observes that modern philanthropy has its roots, first and foremost, in business tycoons’ self-interested desire to shield income from taxation while “garner[ing] prestige and influence in the U.S. and world affairs.” The report’s authors note that large foundations such as the Bill & Melinda Gates Foundation exert influence not just through their “enormous resources” but also “by shaping development concepts and policies.” The Gates Foundation—established in 2000 with an initial endowment of $42.9 billion and amplified by an additional $30 billion from Warren Buffet in 2006—has become the world’s leading global health player as well as the largest non-state funder of the World Health Organization (WHO). As a result of the Gates Foundation’s “tremendous agenda-setting power,” the global health community designated 2010–2020 as the Decade of Vaccines; developed a Global Vaccine Action Plan; and created the public-private Global Alliance for Vaccines and Immunization (GAVI Alliance), which receives almost one-fourth of its funding from the Gates Foundation. The German analysts and others have outlined key features of the Gates Foundation’s close partnership with the pharmaceutical industry, including the revolving door between the staff of the Foundation and pharmaceutical companies such as Merck and GSK; the preponderant focus of the Foundation’s largest global health awards (20/50 or 40%) on research and development of new vaccines and drugs; and the Foundation’s $52 million equity stake in CureVac (a German pharmaceutical company) to speed up development of mRNA-vaccines. The Gates Foundation also has increased its direct support for the biotechnology industry, which is of considerable relevance to the vaccine industry due to the rapidly increasing use of biotech in modern vaccine manufacturing. Recent articles have pointed out, moreover, that the Gates Foundation routinely pays public relations firms to manipulate scientific decision-making in favor of the risky genetic engineering technologies that the Foundation supports.